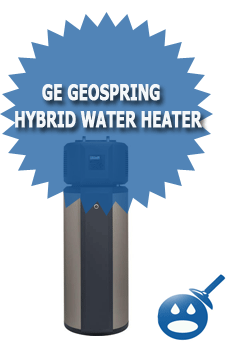 The GE GeoSpring Hybrid Water Heater is the new Hybrid Water Heater from GE. This heat pump water heater is more efficient than other water heaters and can offer a reduction in operating cost of up to 62%. The best part is that this new hybrid water heater is more effective than other models and you will not lose any water by using the GE GeoSpring Water Heater. This hybrid water heater is Energy Star labeled which means that you can start to see the savings almost immediately. It is important to have an efficient water heater since it is the most used appliance in your home. Statistics say that if you combined all of the energy that is used by your washing machine, dishwasher and your refrigerator they would use less energy that your old traditional water heater. By installing a GE GeoSpring Hybrid Water Heater in your home you will see the unit has a 2.35 energy factor and this offers more efficiency than a standard water heater that only has a .088 energy factor. 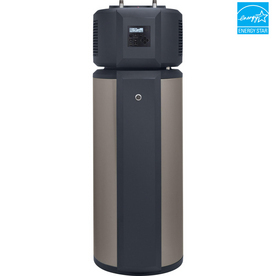 You will not use more energy to operate this hybrid water heater; in fact this water heater uses less than 50% of the energy than that of a 50-gallon tank water heater. This unit uses 550 watts when the unit is in eHeat Mode. The GE GeoSpring Hybrid Water Heater offers an easy to use control panel that makes operating and maintaining your hybrid water heater easier to understand. By following your on screen menu you can set the perfect water temperature and select the mode of operation as well. The operating modes are eHeat, Hybrid, Standard, Vacation and High Demand. While the water heater is in Hybrid, eHeat and High Demand settings the water will travel through the unit and come out of the back end of the unit. There is an air filter in place to protect the evaporator from dust and dirt. One of the safety features of the GE GeoSpring Hybrid Water Heater is the Dry Fire Process. The heating components in this water heater are designed to be fully functioning in water. As the heat builds up and the elements are not in water they may dry out. 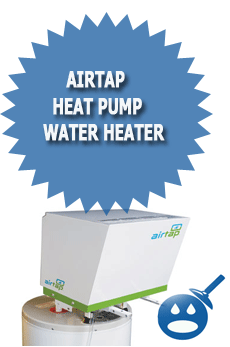 With this system the heat pump keeps track of the temperature in the tank and if the heat starts to rise the system will shut down and will alert the homeowner that water needs to be added. 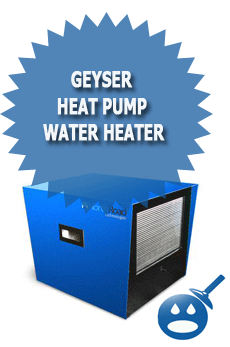 The hybrid heat pump system can be installed in dry and clean areas. The ideal location should be where the most demand of hot water is needed. With this heat pump you will not need an expansion tank unless it is required in your city, check the local building and plumbing codes. It is also recommended that the hybrid water heater have 240 square inch clearances with the vents. When you install the GE GeoSpring Hybrid Water Heater you can receive incentives such as the GE Consumer & Industrial incentives that say if you purchase a GeoSpring Water Heater before December 31, 2010 you may be eligible for a tax credit. There also may be some additional state rebates available, check with your state department of revenue for information. By installing a GE GeoSpring Electric Hybrid Heat Pump Water Heater you can start saving money and energy right from the start. You can have a better operation and more water savings with the GeoSpring Hybrid Water Heater. Visit your local GE distributor for more information. You have an error in this website. The efficiency of an standard electric hot water is .88 or 88%, not .088 (8.8%). That is a HUGE error you really should correct. Of course, during the winter the energy is borrowed from the house heating system so at that time it is NOT more efficient at all. Accuracy is a nice thing. Actually Fred, that is not quite accurate; if the water heater is in an unconditioned space (ie the garage) you aren’t stealing from your home heating efficiency. Dan, if the heater is in an unconditioned space it probably won’t function at anywhere near its stated efficiency (which are measured at 70 deg F) and the backup heating coils will come on a lot. Heat pumps become less efficient (lower coefficient of performance) as the source temperature decreases.